We’ve been careful to preserve the things that made us fall in love with Domaine Le Poteau. It’s a friendly, relaxing, quiet and beautiful little site where you can unwind, enjoy the wildlife and forget the hassles of the outside world. The most stressful thing you are likely to encounter is our very disorganised and not very serious boule tournaments. When you do peel yourself off your hammock or lounger, the beautiful Gers region beckons; rich with culture, gastronomy and outdoor activity. A fabulous, friendly, unspoiled region to explore. Our pitches are large and shaded and carefully spaced to offer privacy and solitude and the two toilet blocks are kept spotlessly clean. 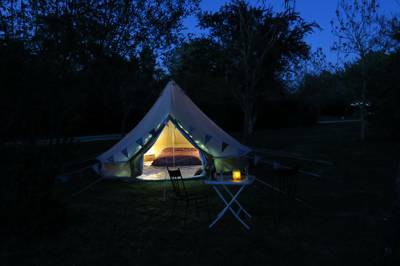 We have a beautiful and stylish Bell Tent. The main tent has a very comfortable bed, lamps, seating and storage. There is a separate kitchen tent with everything you might need. We also have a fully equipped tent. Slightly less glamorous but practical and roomy if you are travelling light. 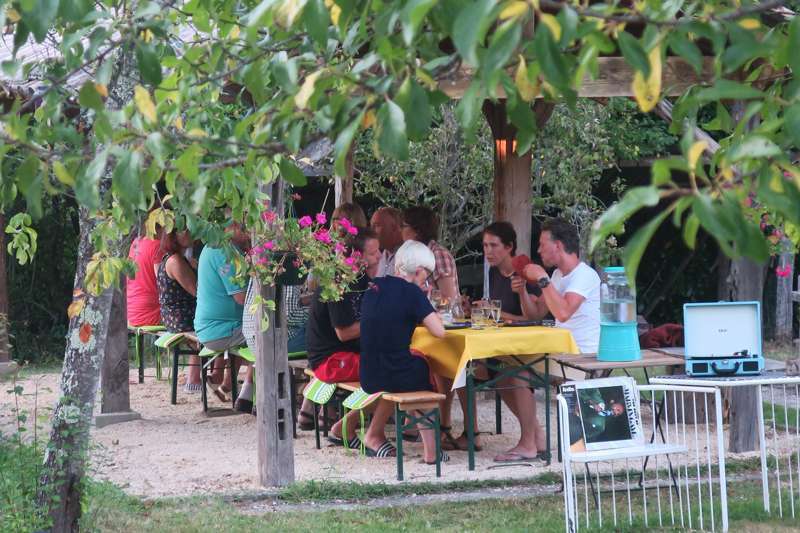 We also have two gites, located at the far end of the vineyard, far enough away from the campsite to provide solitude but close enough to make participating in the campsite activities an easy walk past the ripening grapes. They are well equipped and have beautiful views over the surrounding countryside and village. Our guests describe them as "magical" "calm" "Idyllic". We have a seven-metre, above-ground pool, nestled in a little hollow below a meadow and above our woodland. It is an unusual but delightful spot for a dip. The vineyard, which used to produce Domaine Le Poteau’s own wine and Armagnac, still borders our site, where you may see Jean Jacques, the vigneron, checking his crop. We make sure that as much fabulous local produce is available to visitors as possible – from bread and croissants delivered fresh from the village to the wine you can sip in the orchard and the ingredients used in the traditional French meals served in the evenings. The local village, Castelnau d’Auzan is just an easy stroll from the campsite and gites. It is a really friendly and very welcoming village where you will be able to eat and drink with the locals. We feel that it is really important to support the excellent local businesses which support the life of our community. The other villages that surround us also offer a wide range of markets, festivals, cafes and restaurants. For latest availability and best prices for Domaine Le Poteau, please use the Date Search above. Electrical hook-ups available. Wash-block with showers, toilets, basins, hair-dryers, shaving points, washing machine and tumble dryer. Covered washing-up sinks. Boules court. Small, above-ground swimming pool. Firepits available. Donkeys on-site, lots of wildlife and a small pond on the edge of the vineyard. Alasdair is a keen cyclist and has the lycra to prove it. The quiet routes and wide range of options is one of the things that attracted him to Le Poteau and he is very happy to give tips and advice on where to go. From meandering rambles through country lanes to lung-busting challenges, there's plenty of choice. He and Fiona also have decent knowledge of the local walking routes – just ask. Montreal-du-Gers (9km), Fources (12km) and Larressingle (18km) are all Plus Beaux Villages and essential visits – the photo opportunities are unmissable! In Castelnau D’Auzan (5–10 mins walk) there is a large outdoor pool (larger than the above-ground one on the campsite), tennis courts and a park. You can also try wild swimming in Lac d’Aignan or Lac de Lupiac (each around 30 minute's away). Evening table d’hôte meals are served in the orchard around 2 times a week – Alasdair used to be a chef and whips up some fine fodder – and take-away French food is also often on offer. Local wines are served with dinner. They also make their own zingy lemonade, which is excellent. Fresh bread and croissants can be ordered in the evening for the next morning. In the village (walking distance) there are several small restaurants and an epicerie. The nearest traditional market is in Eauze (10km) every Thursday. The N124 from Toulouse takes you nearly all the way there; you join the D931 towards Eauze where you take the D43 to Castelnau d’Auzan. This is a very rural location and the nearest train stations – Auch, Agen and Mont de Marsan – are all around an hours drive away. The nearest airports are Bordeaux (1½ hour's drive) and Toulouse (1¾ hours). 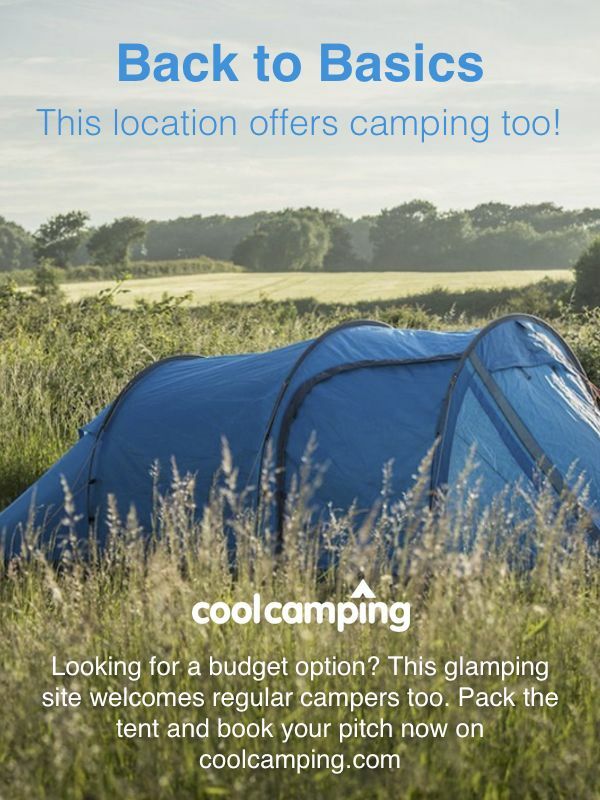 20 grass camping pitches (2 gîtes also available), 1 bell tent and 1 ready-equipped tent.